Boogerman has nothing on this snot spewing piglet. Gesundheit! brings us the everyday adventures of an allergic green piglet on a mission to bring slavering monsters to justice for capturing his friends and taking residence in his once-peaceful village. Despite his obvious size disadvantage, our squat, curly-tailed friend has one thing on his side, the ability to sneeze gigantic blobs of snot on command. It might not make him a hit with the ladies, but his affliction helps him set off pressure pads and lure dim-witted monsters to their doom, so it's not all bad. It also makes for a hugely endearing puzzle adventure, as you tiptoe around the fragrant hand-drawn landscapes, gobbing out phlegm, luring beasties and 'encouraging' these unsuspecting souls into the jaws of instant, terrifying death. The fact that you do so accompanied by the most cracked soundtrack since people stopped making children's television on acid only adds to the impression of gently losing your marbles. This may well be the only game you won't mind losing to, if only to whistle along once again to its death ditty. If Revolutionary Concepts came to charm us senseless, it worked. There are so many reasons to enjoy Gesundheit; its 40 levels of puzzle nonsense are only a small part of why you should dutifully surrender your loose change. 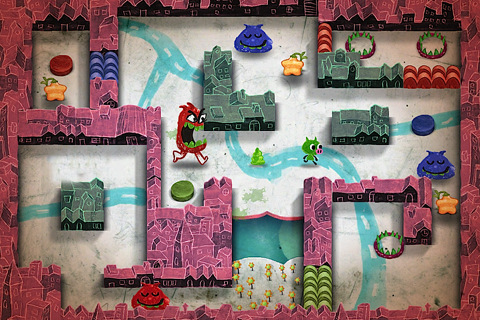 What's Hot: Catchy music, 40 levels, charming concept, hand drawn graphics, Game Center.